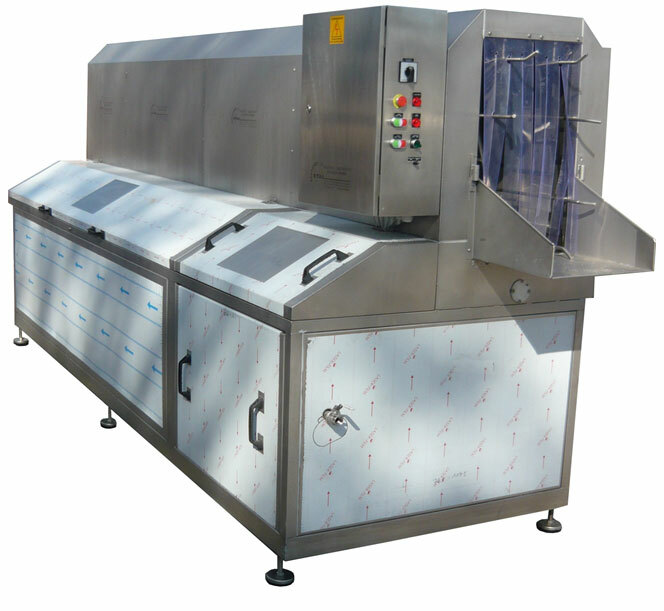 The live bird crate washer is designed for washing containers used for delivery of live birds to the slaughtering plant. The crate washer is made entirely of stainless, acid-resistant materials. It forms an enclosed entity with input and output openings. Crates are placed through the input opening onto the chain conveyor, which transports them along spray nozzles. Water spraying and circulation inside the washer is controlled by pressure pumps, whose size and capacity accommodate the size and capacity of the washer. The washer also includes rotary slotted screens used for separating solid waste from water. The washer also includes a cleaning agent dispenser – the use of appropriate cleaning agents improves washing efficiency.